The focus of Hazeltine National’s Junior Camps is to introduce the game of golf to juniors in grades 3 – 5 and to further develop their ability in grades 6 – 8. Hazeltine Junior Golf Camps are open to member and non-member boys and girls entering grades 3 - 8 ( in the 2019/20 school year) on a space available basis. Hazeltine members and previous year participants are given registration priority. Registration opens March 12, 2019. **Each participant will receive a $25 discount from their registration fee for each friend they bring with them. 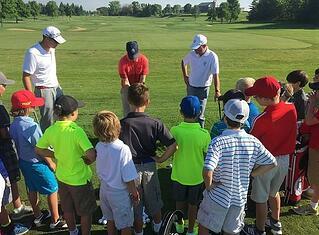 Our mission is to introduce the game of golf during grades 3 – 5 and develop knowledge of the game during grades 6 – 8. At the high school level, juniors can further develop their ability by taking private golf lessons. Private lessons are available for both non-member and member juniors ages 7 and older. Contact Hazeltine National Golf Shop at 952-556-5401. Registration will open for all participants on Tuesday, March 12 at 9:00 am. Registration payment instructions will be included in your acceptance confirmation. Please do not mail the registration fee until you receive the acceptance confirmation. In order to receive a refund, you must notify the Hazeltine Junior Golf at hazeltinejuniorgolf@gmail.com prior to June 10, 2019. Junior golfers will have fun, respect the game of golf, keep an honest score, and abide by golf etiquette at all times. Juniors will also listen to volunteers and program leaders. At no time should juniors drive carts, misuse golf equipment, or abuse of the golf course. If you have any questions regarding bad weather on the morning of golf, please call the Hazeltine Golf Shop at 952-556-5401 or check your email for cancellation notices. We do not have any scheduled rain dates, and we do not provide rain checks.